The pool is closed for the 2018 season. See you next year! Private pool parties are available to MWP residents through reservation with the Clubhouse Secretary during normal clubhouse business hours. After hours parties: 2 hours for $100, 3 hours for $125. Day parties: $50 for up to 10 people. Payment MUST be made two weeks prior to the party. A 48-hour cancellation notice must be given by the resident to the Clubhouse Secretary. If notice is not given, one-half of the rental fee will be withheld. In cases of cold/rainy/inclement weather, cold pool temperatures, mechanical breakdowns, or pool closure by the Pool Manager, the party will be rescheduled or the rental fee refunded. 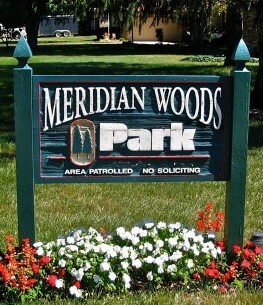 The Meridian Woods Park Marlins is a competitive recreational swim team with swimmers ranging in age from 5 – 17 years old. Our season runs through the months of June and July. Safety is of primary importance to those who use the pool. It is for this reason that the following rules exist. Please see that all family members and guests are familiar with them. Physical limitations: Parents are asked to advise the pool staff of any problems their children may have. Anyone who wishes to use the deep water end of the pool must be an able swimmer. Pool staff may restrict use of the deep end or require a swim test for those wishing to use deep end. Any child under the age of 12 must be accompanied by an appropriate person, age 16 or above, chosen by the parent, who will be responsible for that child’s conduct. Break period: The pool staff will clear the pool for the maximum of 15 minutes every hour. During this time the water will be inspected and tested. Adults (18 and older) may swim during this period. No one else is to be in, on, or near the water. NO FOOD OR BEVERAGES may be brought near the pool beyond the deck area near the snack shed. (This is an Indiana State Board of Health rule. Rule 410 IAC 6-2 (Revised) Rule 410 IAC 6-2-5.) Also, there are to be no glass containers in or around the pool area. All trash should be discarded in the trash containers. SWIMMING AND ALCOHOL DON’T MIX! Anyone suspected of being alcohol-impaired will be denied entrance to the pool. REMEMBER: YOUR POOL IS A SMOKE-FREE ENVIRONMENT. Use of rings, rafts, balls, water toys, masks, snorkels, swimming aids, etc. are at the discretion of pool staff. Pool staff may prohibit use of these items if they are creating unsafe swimming conditions. Have your child use the toilet facilities before entering the pool and also the same when the need arises. Children needing diapers MUST be in swim diaper. Diapers are to be changed in the restroom, where changing tables are provided. All persons using MWP recreational facilities (the surrounding areas as well as the pool) MUST conduct themselves in a manner that will not offend others. Those displaying objectionable behavior or using offensive language will be asked to leave. If repetitions or more serious problems occur, they will be reviewed by the MWP Board of Directors and violators may be suspended from the pool area for the remainder of the season. All children in the baby-pool or its enclosed area must be supervised by an adult. The telephone at the pool is for EMERGENCIES and MWP pool business only. This line needs to remain open in case of emergencies (Indiana State Board of Health Rule, 410 IAC 6-2-6k). Pool personnel WILL NOT give your child any messages, so please do not call and ask them to. Maximum number of persons allowed in the pool enclosure will be 100. The MWP Pool is for the use of MWP members only, with limited guest privileges. Use of the pool facilities will require the current year pool passes to be shown to the lifeguard(s) on duty. A new pool pass will be issued each year, for each eligible resident after all association membership dues have been paid. Anyone allowing a non-member to use their pass will have their pass and pool privileges suspended for the rest of the summer. Dues must be paid to, and pool passes will be updated by, the Clubhouse Secretary during regular business hours. Replacement passes will be issued at a cost of $5.00 per pass. New residents may obtain pool passes by phoning the clubhouse (317-784-2872) in advance to allow for preparation. Dues and validation cannot be accepted or performed by pool personal under any circumstances. The life guards are here to protect swimmers and do not have authority to collect dues or validate passes. Any resident, who has not paid their dues or does not have their current pool pass, will not be admitted to the pool. Two grandchildren per household will be admitted free when accompanied by a resident grandparent with a valid pool pass. Guests: A Guest Pass will be available for a fee of $30 and will allow residents to bring up to 2 guests per adult pass per day during the season. We will not be doing daily guests this year, in order to bring a guest all residents must have a guest sticker on their pool passes. A Member-Sponsored Non-Resident Pool Pass will be available for a fee of $200.00 (limited number). A member family sponsors a non-resident family for the season. Non-resident family may use the pool unaccompanied by the sponsor family. Both parties will be required to sign a contract. Visit the MWP Facebook page.